A new view of the previously announced Nikola Two, the company’s American heavy-duty truck, which can be made with a fuel cell in its powertrain or a battery pack. The Nikola Tre will be the company’s debut into the European trucking industry. The vehicle will go into production by 2023, Nikola says. The most important of these debuts were the trucks: Martin admitted later in a private discussion with the press that truck sales would make up the bulk of Nikola’s business and revenues. Back in 2016, Nikola announced its Nikola One truck, promising that by 2020 it would have a truck for sale with 1,200 miles of range from a combination battery pack charged by a hydrogen fuel cell. Although the new commercialization date is 2022, Martin said last night that Nikola is on track to meet that deadline. CEO Trevor Martin had a very Silicon Valley-style product announcement last night. Nikola CEO Trevor Martin and Jesse Schneider, the company’s VP of hydrogen technology. Nikola CEO Trevor Martin called this “The Stormtrooper,” and we can see why. The Nikola NZT is the company’s off-roading vehicle. The NZT has a slew of premium features, including AC and heating, which normal ATVs don’t have. Speaking to press, Martin said that Nikola decided to offer an all-battery option for its trucks so that the company could fit any route. “Weight is so important in the trucking world, every pound is worth 50 cents,” Martin said. But, he added, as batteries get more efficient over the next several years, the balance between battery weight and fuel cell weight might even out over time. Martin said twice last night that he expects hydrogen fuel cell trucks to make up 80 percent of the company’s truck orders, and all-battery trucks to make up the other 20 percent. “The powertrain of the truck, whether it’s hydrogen or electrical, is identical,” Martin said, adding that customers can order trucks with hydrogen as a fuel, or they can order trucks with a 500, 750, or 1,000 kilowatt-hour (kWh) battery pack. An efficiency figure for those batteries was not disclosed, nor did the company say who would be supplying the battery packs. Still, the most important thing to come out of last night was the presence of actual demonstration trucks, which will be driving around a convention center track for spectators today. The company has faced criticism for talking big without proof that it can actually make a truck, so offering concrete evidence of Nikola’s seriousness is important. “But I didn’t want to make it incrementally better,” the CEO said. Last night Nikola also showed off the Reckless, a military-grade UTV, which appears to be a heavier-duty extension of the NZT. Company representatives noted that the Reckless’ advantages are primarily in stealth. 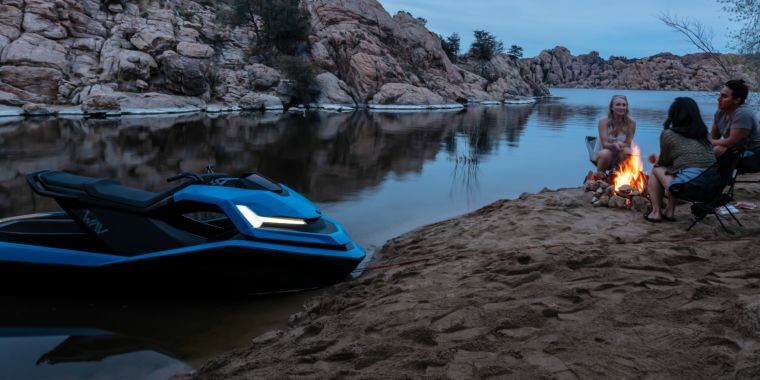 The UTV makes less noise compared to a diesel-powered UTV, it has almost no heat signature (especially if it’s operated in either the remote-control or autonomous modes, without a human in the passenger seat), and it can be fully submerged in water. It’s unclear whether the company has a contract to sell these to the military yet. Finally, Martin announced the Water Adventure Vehicle (WAV), a jet ski with no emissions and little noise pollution. “Just as we’re disrupting how we move on the land, we’re disrupting how we move on the water,” Jordan Darlin, Nikola’s VP of Powersports told the audience last night. “You’ll now be able to explore the most pristine waterways without impacting the environment,” Darlin added. Like the NZT, the WAV is set for commercialization in 2021. Few specs were given for the new jet ski, other than Martin mentioning that it has a 12″ 4K display that is apparently fully submersible. Reservations for the WAV opened up last night. Automotive engineering and electronics firm Bosch worked very closely with Nikola in developing the company’s trucks and off-road vehicles. The truck features a vehicle control unit (VCU) running a “secure operating system that provides real-time, over-the-air updates and monitoring,” according to a press release from Bosch. In a conversation with Bosch prior to last night’s launch, commercial vehicle vice president Jason Roycht said that Bosch’s relationship with Nikola was special, and the company had a team of engineers in Phoenix helping Nikola build the “not so interesting,” but necessary parts of the truck. These include optimizing Nikola’s trucks for fuel efficiency (unsurprisingly, Nikola’s first trucks will be sold with fuel contracts, so the company essentially shoulders the burden of paying for fuel), as well as modeling truck designs to manage braking and other thermal issues that come with driving a very heavy vehicle. Despite skepticism around hydrogen as a fuel in general, Roycht said Bosch thinks fuel cells have potential in freight, where routes are more or less preplanned and it will be easy to set up corresponding refueling centers. A recurring theme at last night’s announcement was that regulation is a burden unsuited to innovation. Martin pulled Arizona Governor Doug Ducey (R) on stage to praise Nikola’s new home state, Arizona, as a low-regulation environment. Nikola recently acquired large tracts of land in Arizona to build its manufacturing center and recently-announced hydrogen lab. The company has promised to employ thousands of people in exchange for local tax breaks. In response to a question about what government could or should do to foster zero-emissions innovation, Martin said he hoped regulators would “get out of the way,” claiming it could take three to four years to permit a hydrogen refueling station, when it needs to take much less time. But Nikola isn’t totally averse to the long arm of government. In May of last year, Nikola sued Tesla for $2 billion, claiming that its Nikola One truck cab, which debuted before the Tesla Semi, looked “substantially similar” to Tesla’s all battery electric cab. In December, the case was transferred from Arizona District Court to the Northern California District Court (PDF), where a judge is permitting a one-year discovery phase. Currently, though, Nikola seems adequately-situated, especially on the financing side of the company. Martin said last night that his company is about to open a $1.5 billion financing round, without any debt yet. Responding to a question about whether he plans to take the company public, Martin said no and pointed to Tesla. “I feel really bad for what Tesla’s going through,” Martin said, explaining that he thought the company was getting unfairly penalized for missing targets.